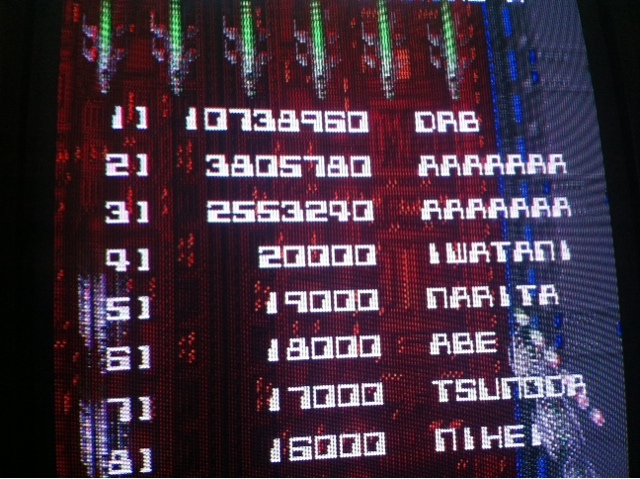 After months of Raiden DX, I popped in Fire Shark and exhausted myself of it in two days, then popped in this UPL Classic and absolutely killed my old score! I made the second loop after maybe a dozen credits and proceeded to die on stage 2 of the second loop due to the speed of the bullets, which takes a bit of time to get use to. It's such an awesome game with its excellent soundtrack and chunky sprite work and proximity scoring. I'm currently on the hunt for some new pcb's for the collection - namely, Gunnail and V-Five as I want to actually have some new things to play. Apparently caldwert has gone all crazy now with pcb buying and his short list of awesome he added to his already considerable stable of games inspired me to add at least a few. I did sell off Big Bang to eXidy as I just think I had enough of that game. Fun, yes, but working on stage 6 and 7 just bummed me out too much. There's that point of frustration that sets in and I have learned to try and enjoy games rather than just try and beat them - it certainly makes for a more enjoyable experience!